Even though it’s been a year since Chenique and Asi have been named the Capital Region Couple of the Year, we’re still talking about their wedding! The couple chose to have their March wedding at 90 State Events, and because the weather in Upstate New York has a tendency not to cooperate, there was a minor blizzard. Not to be deterred by the the weather, all of their guests were still able to attend and celebrate the happy couple. For the Couple of the Year, we brought out our most impressive drapery work to create a jaw dropping Total Events Transformation. The ceremony featured a romantic, draped backdrop with taupe chiffon and burgundy accents. The ceremony drapery then transitioned into the backdrop for the DJ during the reception! A second way we used drapery at the wedding was to create a dramatic backdrop for the sweetheart table, featuring our burgundy linen with the Monique White Lace overlay from The Collection. Additionally, on the other side of the ballroom, we featured layered drape for a beautiful entryway while the Bridal Party was announced. 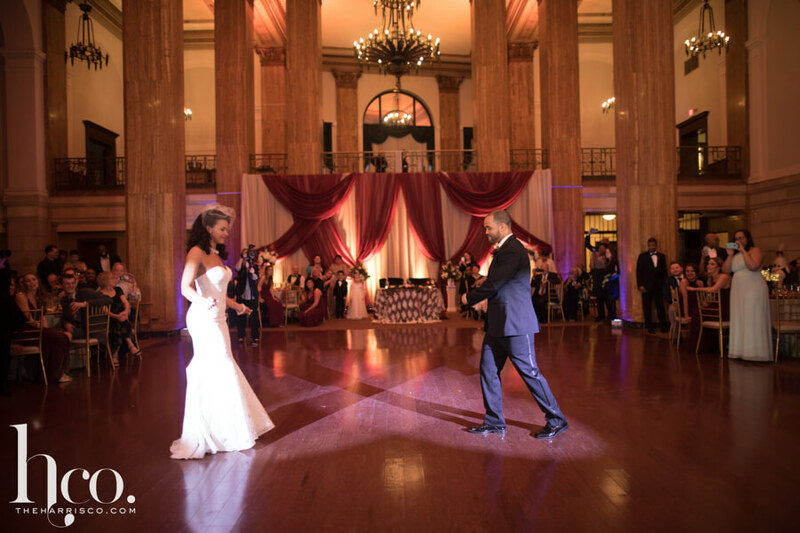 Check out photos from Chenique and Asi’s wedding from The Harris Company below! For more photos, make sure to visit our Couple of the Year Pinterest board!